Though times may seem crazy right now, the early 2000s were a doozy, as well! The economy was down the tubes and many areas in America were feeling it. Jobs seemed to be disappearing and everyone was replaceable, whether it be by a machine or someone willing to do the job for less pay. 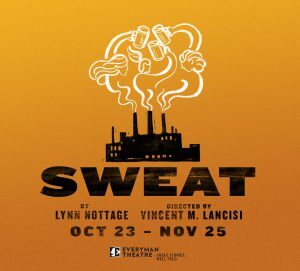 Everyman Theatre’s latest offering, Sweat, by Lynn Nottage (their fourth Nottage produced work), Directed by Vincent Lancisi, gives us a peek into one community as their security and way of life seem to be slipping from their fingers and there are no easy answers. 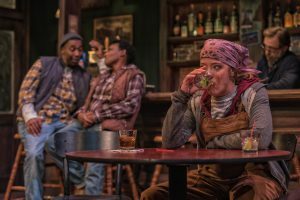 Sweat is a Pulitzer winning play by Lynn Nottage and centers around the working-class of Reading, Pennsylvania. It bounces back and forth between 2000 and 2008 and concerns itself with three longtime friends, Cynthia, Tracey, and Jessie, who have worked at the same factory for years. The economy being what it is, there are fears that the factory is laying people off and even a possibility of it closing its doors for good. Suddenly job security is taken away and the characters have no idea what to do with this new feeling except express disbelief. Two of the friends, Cynthia a black woman and Tracey a white woman, apply for the same management job and Cynthia lands it, perplexing Tracey, who has a few years of experience on Cynthia. Soon, the company moves jobs to Mexico, the trade union goes on strike and the workers are locked out of the factory, putting Cynthia in a hard position. The new hierarchy of management vs. workers begins to put a strain on the friends, while racial issues widen the already growing gap, as well. I’ve got to admit. 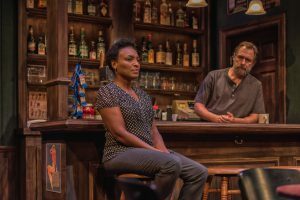 I’ve seen a few Lynn Nottage plays and… I can’t say that I’m a fan. It’s not because the stories aren’t moving or the performances were poor, but… the script. Sweat seems to be trying too hard for some reason. The dialogue makes the very able actors seem scripted and unnatural, for some. I just can’t seem to get invested in any of the characters of a Nottage piece, as much as I want to be. 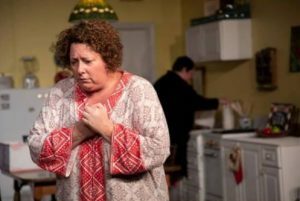 Ensemble pieces are hard to write, I’m sure, but Nottage seems to have a bunch of smaller sub-plots going on and she seems to leave characters hanging with no real resolutions. If she stuck to one or two plots, she might be more successful in fleshing out the characters, who have so much potential, a little more. I will say, the tension of this piece does come through, such as the racial issues and union vs. non-union folks, so, there are some highlights. That’s not to say her writing is bad, but, she could put more time into some of her characters. However, check it out and judge for yourself! Daniel Ettinger has, once again, outdone himself with this Set Design. It’s a masterpiece unto itself. 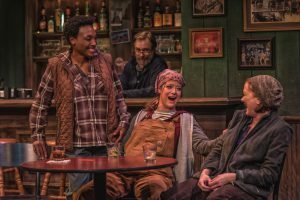 With a fluid set revolving from a dank, blank area that is used as an office and low-income apartments to the lavish but cozy neighborhood bar, this Set Design is superb. 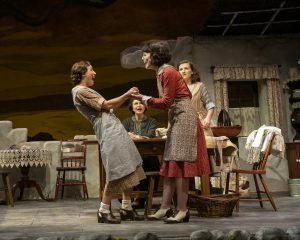 The attention to detail is not to be missed and Ettinger is to be heartily applauded for his work on this production. 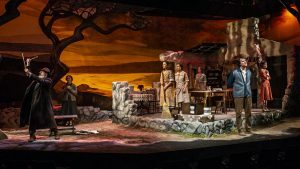 Working in tandem with Ettinger’s Set Design, Lighting Design by Harold F. Burgess II and and Sound Design by C. Andrew Mayer are impeccable. Setting just the right moods for each scene and adding emotion and just the right amount of intensity to the piece rather than drawing attention from the action, make Burgess’ and Mayer’s work flawless and adds value to this production, in general. Kudos to them for jobs very well done. Costume Design by David Burdick is spot on and his presentation of the first decade of the 21st century is stellar. Not only a general style, but a specific, blue-collar style shines through in Burdick’s design putting the audience right smack dab in the middle of the time setting and adding a sense of authenticity to the entire piece. 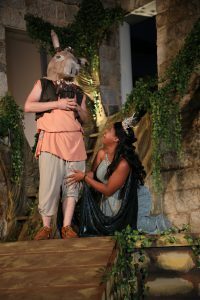 Vincent M. Lancisi, Founding Artistic Director of Everyman Theatre, takes the helm of this production and he certainly seems to have a solid grasp of the story and each character. His staging is impeccable and the pacing is near perfect. 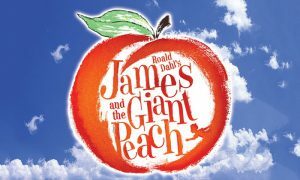 His vision is apparent and his casting is superb, working with resident company members and non-members, pulling together a cast that has a natural chemistry and understanding of their characters. 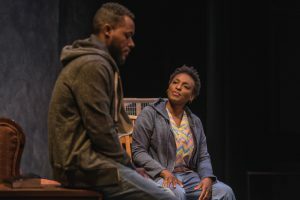 The subject matter is delicate but Lancisi takes it and presents it in a way that’s easy to follow and entertaining, all the while making the audience think about the trials and tribulations of folks who may be living these same scenarios right at this moment. Kudos to Lancisi for an exquisite job. 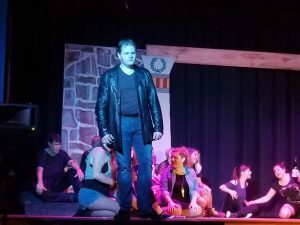 Moving on to the performance aspect of this production, Jason B. McIntosh portrays Evan, the parole officer and though he is believable he comes off as scripted and stiff at times. 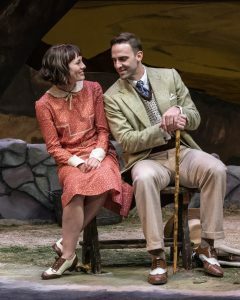 He only has two scenes at the beginning and end of the play, and most of the problem may be the dialogue, but he manages the short stage time he has nicely. Vaughn Ryan Midder portrays Chris, the young man who has dreams of getting off the factory floor by going to school, and Matthew Alan Ward takes on the role of Jason, his close, longtime friend who seems content on the factory floor, but still has big dreams with the money he could possibly make. Both of these actors are quite able and work well with and off of each other, giving 100% effort to their roles. However, Ward does seem a bit forced in his role and uncomfortable with the dialogue… at first. As the production moves along, he gets more comfortable but there’s still a certain stiffness in his delivery, but, again, this could very well be Nottage’s dialogue itself. Stronger of the young duo is Midder, who plays his role with an authenticity that shows he certainly has a good grasp on his character and is comfortable in his actions and delivery. JaBen Early plays, Brucie, the out-of-work partner of Cynthia, who has resorted to dope to get by, but is seemingly trying to get back on track. Early seems to have a good understanding of this character and plays him confidently, but I just don’t buy that this character is a dope feign. Once again, I don’t think I can blame the actor for this… it’s Nottage’s writing or director’s decision. 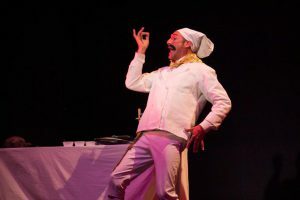 It’s mentioned repeatedly that this character, Brucie, is on dope, but it’s not really presented in the dialogue or in the action and portrayal. I can tell Early is a damn fine actor, but in this role, unfortunately, it doesn’t come across so clearly. Alejandro Ruiz, however, as Oscar, they Latino barback who just wants to get ahead in life and work, is more of a character one can invest in. He means no harm, but is accused of things for which he is not responsible. Ruiz plays the role smoothly and unassuming which is absolutely required for this character. His delivery is natural and his presence is strong, making for a wonderful performance. 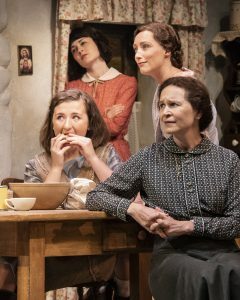 In this production, we are treated to resident company actors and highlights, the incomparable Dawn Ursula, Deborah Hazlett, and Megan Anderson. These ladies never cease to amaze and impress. 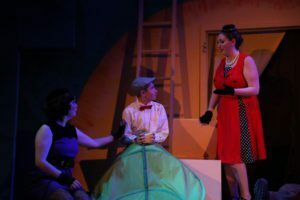 Ursula, as the level-headed Cynthia excels in this role as she gives us just the right amount of emotion to portray the conflict of management vs. friendship all while dealing with an out-of-work partner and maturing son. 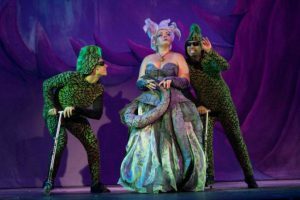 Though, it takes a minute to ease into Ursula’s performance (she starts off a bit rigid and deliberate as opposed to natural), 15 minutes in, you get her groove and it’s smooth sailing from then on. She has a tight grasp on this character and portrays her beautifully. 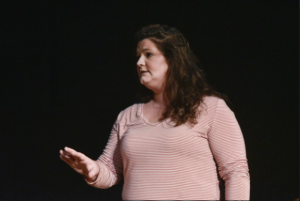 Hazlett, as the hot-headed, content Tracey gives a stellar performance as a woman who is not so much narrow-minded as she is set in her ways, but can definitely come off as narrow-minded. Her delivery and stage presence is authentic and her understanding of this character and her trials and tribulations is very apparent. Anderson’s take on Jessie is superb and her usual authenticity shines through in this role. Anderson is quite comfortable in this role and she has a certain appreciation for her character, playing her with a perfect blend of dignity and spitfire. All of these actors have an impeccable chemistry and work well with and off of each other. All three should be applauded for their work in this poignant, important piece. 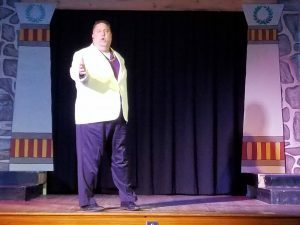 A definite standout in this production is Kurt Rhoads, who takes on the role of Stan, the laid-back, impartial (most of the time) bartender of the small neighborhood bar. Rhoads’ performance is flawless with his booming, but soothing voice, and easy delivery of his dialogue. He has a deep understanding of this character and plays him with a rough-around-the-edges exterior but an empathetic and compassionate interior. Somehow I connect with this character (one of the only ones I truly connect with, really) and see him as the wise, worldly old uncle at a family gathering, which is what a bartender of a neighborhood bar should be, anyway. Rhoads gets this character and his performance is spot on. He is one to watch and should be commended and praised for this marvelous performance. Final thought… Sweat is a serious, in-depth look at middle-class America and its inhabitants. 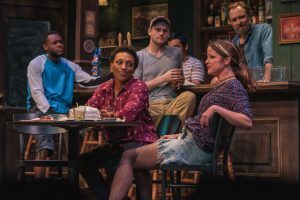 Concentrating on the trials between family, friends, and work, and the fine line that separates these parts of life, Sweat gives us a peek into a blue-collar town in Northeast America and looks beyond skin color and other surface differences to express the kinship and ideals of the characters within. With very real and hard situations, Sweat manages, to tell a story that is relatable to many. Speaking of the story… it’s good. 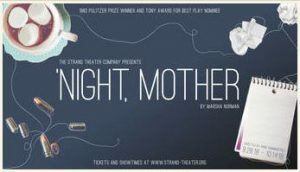 It’s very good but, unfortunately, Lynn Nottage’s script doesn’t do it justice. It seems to be trying too hard to present this middle-class group of people and the dialogue ends up sounding forced and phony, taking away from the other not-so-unfortunate parts. Overall, the production value is top notch and the performances are on point. 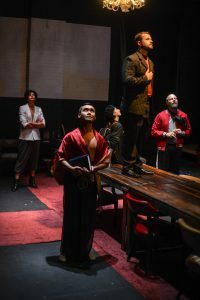 It’s another bona fide success for Everyman Theatre and, forgiving the script and dialogue, it’s definitely worth checking out! 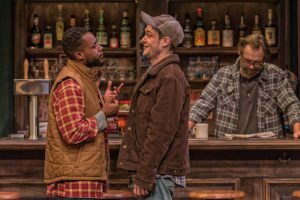 This is what I thought of Everyman Theatre’s production of Sweat… What did you think? Please feel free to leave a comment! 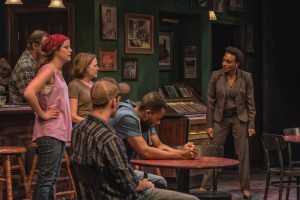 Sweat will play through November 25 at Everyman Theatre, 315 W. Fayette Street, Baltimore, MD. 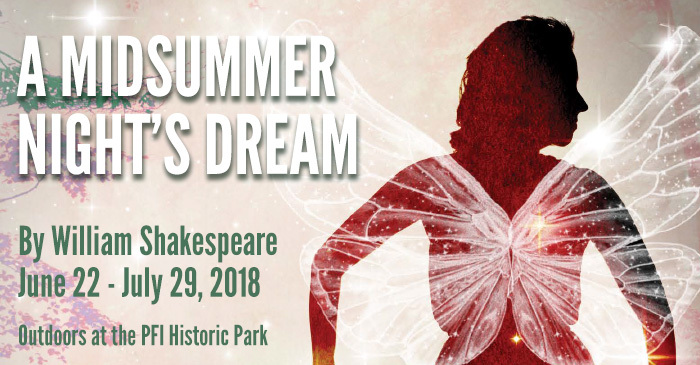 For tickets, call the box office at 410-752-2208 or purchase them online. 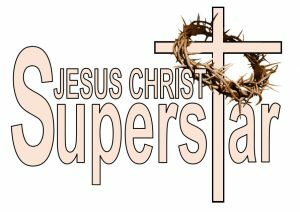 Jesus Christ Superstar, a story that is familiar to some, while at the same time refreshing and new for a younger generation continues to tell the story about Christ’s final days before his death and resurrection. 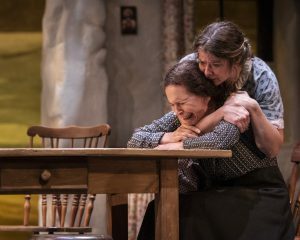 It’s message about the plight of the poor and underprivileged resonates just as strongly as it did when it first premiered on Broadway in 1971. 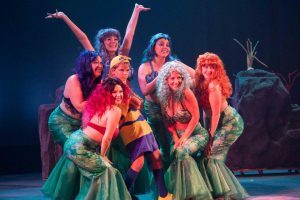 Just Off Broadway’s adaptation of Andrew Lloyd Webber’s rock musical, Directed by Jason Crawford Samios-Uy and Patrick Jay Golden, with Music Direction by Patty Delisle, and Choreography by Katie Gerstmyer, comes alive on the Baltimore stage. 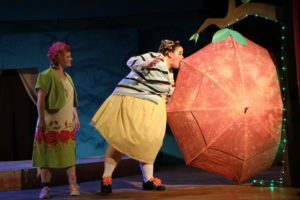 Despite the small space and minimalistic set design, this show packs a punch for audiences of all ages. What it lacks in appearance, it certainly more than makes up for it with its talented cast of performers. 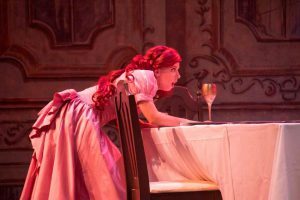 This show truly had all the components of a strong performance: Strong vocals, imaginative choreography, and powerful acting. As soon as the lights come up, the audience is very aware of the urgency that Caiaphas mentions when speaking about the dangers that Jesus poses to their Roman traditions and ideals. Five men emerge in darkness with masks and riot gear. 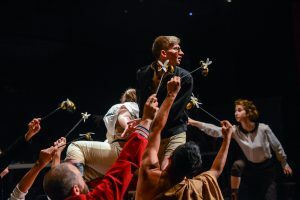 The familiar chord progression reverberates in the ears of the audience as a fight begins over Jesus’ presence in Rome. 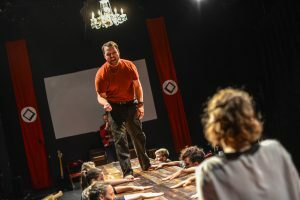 Audience members get to meet Judas, played by Jim Gerhardt, for the first time in this scene. 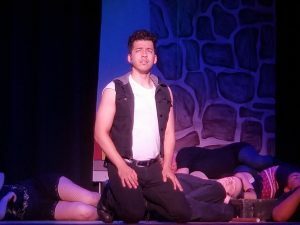 As an audience member, hearing Judas sing the first vocals of the song really drew me in. 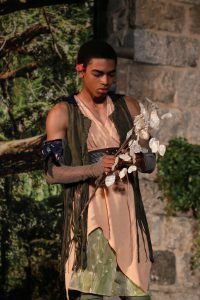 Gerhardt is extremely talented; his voice and acting are mutually impeccable. On the other side of the stage, we see Jesus, played by Luis “Matty” Montes, emerge from the crowd of believers. 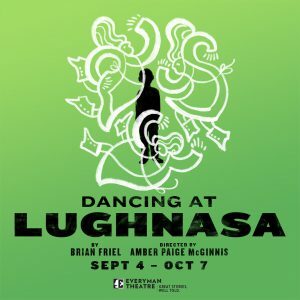 An overwhelming sense of foreboding fills the air of the theatre– The harmonizing voices, the presence of Caiaphas and the other High Priests, along with truly haunting accompaniment by Patty DeLisle and the orchestra sets the tone for the entire show in the first few moments. 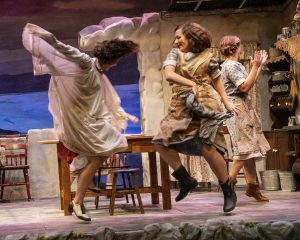 Throughout the show, the audience has the chance to see many different kinds of choreography under the direction of Katie Gerstmyer. 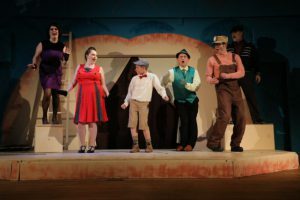 I applaud Gerstmyer in her foresight and structure of the choreography– it was structured enough to look uniform but freestyle enough that each ensemble member was able to create their own character choices throughout the production. 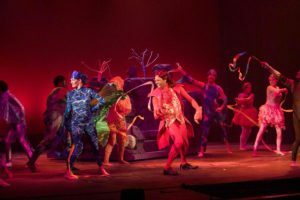 For instance, in the beginning of the show, the audience can clearly see that the cast is filled with strong dancers. Even those who are not the most skilled still had space to create a character that perfectly accompanied their artistic dance choices. Soon enough, the audience gets to meet the highlight of the show, Mary Magdalene, played by Jennifer Lutz. Lutz’s voice provides a strong and clear contrast to her male counterparts. She carries the role with poise, gusto, and so much dedication. 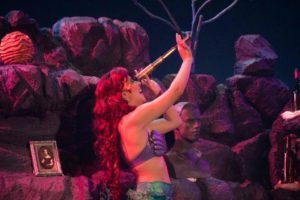 She is constantly engaged in her craft– no matter what is happening on stage she remains engaged and dedicated to the scene. 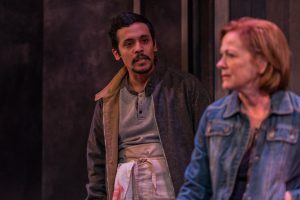 It was refreshing to see such vibrant chemistry on stage between Jesus and Mary– you can clearly tell that both actors have put in the time to create dynamic and powerful relationships with each other. The tones of Mary’s voice fade away and are replaced by the deep, smoky tones of Christ Thomas’ interpretation of Caiaphas, the High Priest. Thomas is a truly terrifying entity on stage with his band of not-so-merry men. The entire group of High Priests (Dave Gerstmyer, Nick Ruth, Randall Noppinger, and Lee Knox) take their role seriously which only adds to the ominous mood set by music. During the song “Hosanna”, the ensemble proves its true ability as vocalists. The harmonies that they create together on stage are extremely clear and crisp in their execution. Unfortunately, I was so distracted by the strange lighting choice during the second half of that song that I was not able to focus on the music or story. 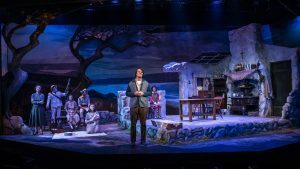 I felt that this lighting choice was very out of place– the song “Hosanna” is all about Christ being willing to fight and die for his followers. Meanwhile an upbeat style lighting was occurring above the stage; the shifting blue-yellow floral lighting was too upbeat, and took me out of the scene. A refreshing voice came from Simon, played by Josh Leach, during “Simon Zealots / Poor Jerusalem” I was forced to stop taking notes just so that I could soak up Leach’s soulful voice. His spellbinding serenade to the audience combined with the vivacious music provides a clear contrast to Jesus’ foretelling of events in the second half of the song. Being only a Senior in Mt. Hebron High School, he still has a lot of time to perfect his vocal craft. I have no doubt that this young man will develop into a performer that is even more confident, capable and talented than he is now. 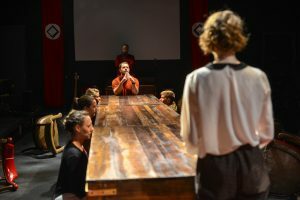 Throughout each interaction and glance, the audience witnesses the expansion of the void which continues to widen between Jesus and Judas. 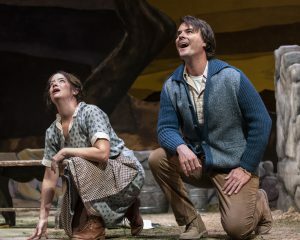 Both actors add to this conflict in their own unique way, whether it be stolen glances, interactions with other characters or face to face moments– it is obvious that both Gerhardt and Montes are dedicated to the storytelling that they began. 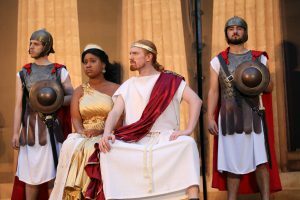 As the show continues on, we meet Pontius Pilate, portrayed by Mike Zellhofer. 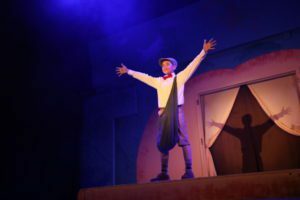 He emerges from the back of the theatre and walks forward to Jesus as he contemplates his dream that foretells his interaction with a Galilean. Zellhofer has a very unique voice; both soft and contemplative, while at the same time possessing a fervor that touches the audience in an emotional way. The temple scene was as fitting as it was haunting, the lighting enhanced Jesus’s reaction to the tide of humanity that even he seemed powerless to redeem. 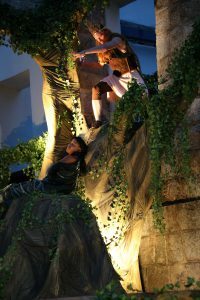 While the efforts made by the cast were very convincing in this scene, I was distracted by some cast-members who interacted with stage props in a less convincing way, such as when several actors hid underneath the stairs leading up to the stage. Despite this, the audience can still feel how overwhelmed Christ is when the sick come to visit the temple, and his reaction is both moving and palpable. There is a sense of urgency when Mary dives to catch Jesus–she sings her familiar voice as the sick clear the stage. Lutz reaches the climax of her song with gusto, confidence and poise. She reaches notes with strength–truly serenading the audience. Meanwhile, Judas’s inner conflict is displayed clearly when he goes to the high priests. Here the lighting is both effective and immersive, as is the feeling of when Judas betrays Christ–here again his emotions are palpable. 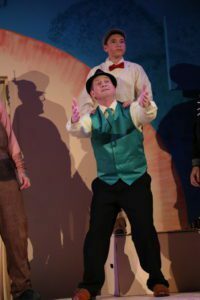 His sadness is a weight that is felt clearly by the audience, and is also enhanced by the eerie yet harmonious undertones of the ensemble’s “good old Judas” as the lights dim for intermission. 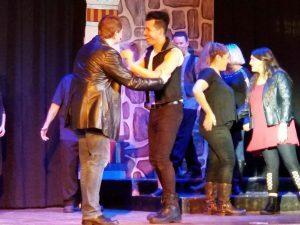 Overall the cast is enthusiastic, and while the costuming is simple it fits the punk and rockstar vibe that characterizes the show and distinguishes it from other adaptations. 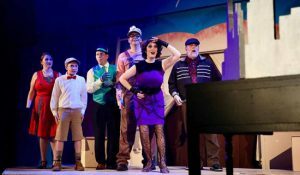 The talented vocal cast lends its hand in helping to bring the audience back in following the admission by delivering a beautiful chorus that tells the story of a people who drown their sorrows and grief in gentle pools of wine. Judas and Jesus in this scene go back and forth, vocally competing, the clash of their worldviews acting out in person Jesus begins to doubt himself in his conversation with his Father. He is clearly troubled, and brings Jesus self-doubt and hate to life. It is here that Montes really displays his vocal range to the audience, and during this troubling monologue. 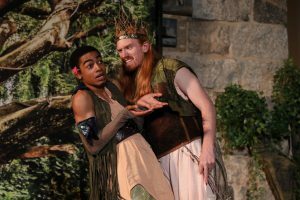 Following the arrest of Jesus at the hands of the Romans, King Herod, played by Atticus Emerson, provides a welcome comic relief to the conflict at hand. 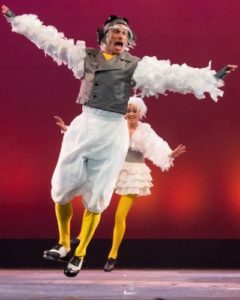 His performance is spirited, humorous, and lively, fitting the style and poise of the original piece. Following Herod’s performance, “Could we start again, please?” is by far the most beautifully simplistic and minimalistic piece in the second act. The harmony of Mary and Peter (played by Jeff Baker) was thoughtfully coordinated and stunningly done. For those who know the story, we know and feel the weight of Judas’s death. 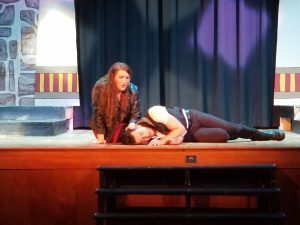 I was brought to tears as Judas asks, “Does he love me too?” Judas knows what he must do, stating “My mind is in darkness now” as the music swells as the ensemble members in black lead him away, towards suicide. 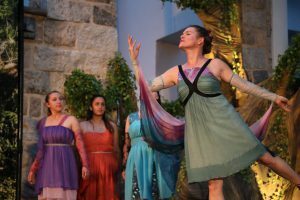 The flogging of Jesus was so creative–this is a very controversial to address, let alone depict–yet Katie Gerstmyer–covered in blood, “lashes” Jesus’s back, while dancing to symbolize the whipping–truly the most intuitive way to show the 39 lashes. Judas comes back adorned in white with angels in tow, asking “Jesus Christ, who are you what have you sacrificed?”. His reaction to his old friend’s death is simultaneously sobering yet striking, and also provides the chance for his character to stun the audience one final time with his voice. The final scene where Jesus is put to the cross is particularly striking, Montes’ interpretation of Jesus’s shock and desperation at his fate at the hands of the Romans is strikingly and starkly human. It is here that we see Jesus standing inside the cross, weeping in fear, set to the near-demonic tone of the audience. With the lights suddenly going out, we see Jesus taken away into oblivion, removing him from the stage, and by extension, from his connection to the living. 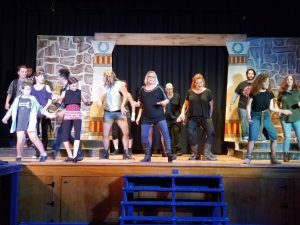 In summary, I’ve seen many different adaptations of Jesus Christ Superstar, but for me it is the cast that makes this show what it is; the actors are clearly passionate, the musical direction is superb, and the directors have proved their creative abilities. 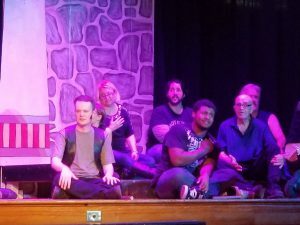 The show has three more performances. Be sure to catch this buzz before it’s gone. 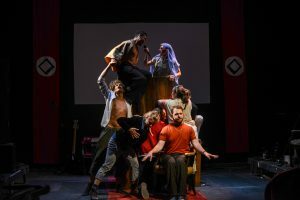 This is what I thought of Just Off Broadway’s production of Jesus Christ Superstar… What did you think? Please feel free to leave a comment! 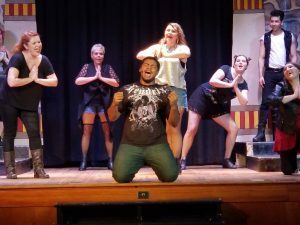 Jesus Christ Superstar will run through October 21 at Just Off Broadway @ Epiphany, Epiphany Lutheran Church, 4301 Raspe Avenue, Baltimore, MD 21206. For tickets email tickets@justoffbroadwaymd.com or purchase them online. 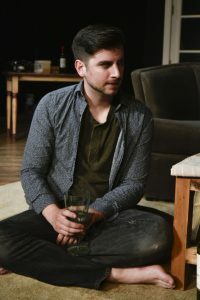 My grandfather always told me that, “anything worth doing, is worth doing right.” While we are not connected familiarly, singer songwriter Ross Martin obviously agrees. 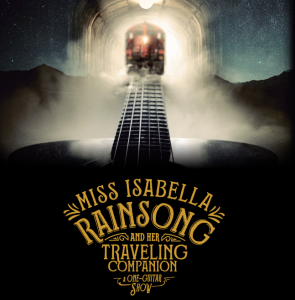 Over twenty years went into the creation of Miss Isabella Rainsong and Her Traveling Companion, and it is well worth the wait. For me, this was a unique experience because I had never seen much less covered a play about one man playing a guitar. From the very moment the light came up Martin shows his audience that this is not a concert. This is not a play. This may not even be entertainment, but what it is, is an immersion into a life experience that will run the gambit of emotions and hopefully leave you feeling human as you come out the other end. Martin is a living, breathing concept album that will leave you yearning for his next release. Set inside a current day Amtrak passenger terminal in Anniston, Alabama we find a lowly traveler (Ross Martin) waiting for train service to resume. A brutal storm and tornado sightings have forced the suspension of service. The traveler views the audience as fellow travelers, and being the southern gentleman that he is, takes this time to introduce himself. He notes that it appears we are going to be sitting here for awhile and asks if he may share a story. The story he shares is his. An average, every day person who is at a point in his life where he needs a helping hand. There is nothing special about this traveler. He could be any one of us in the audience or reading this and for me, that is what brought me into the story. Mr. Martin is not only a talented singer, but performer as well. His portrayal of the traveler is genuine. He does not try to make you feel sorry for him. He doesn’t even offer an explanation of circumstances as to how he got to this point. He doesn’t have to; he is us. Unbeknownst to him, help is around the corner in the form of Miss Isabella Rainsong (Dolly Rainsong), in the form of a guitar. (To find out more about Dolly Rainsong, the companion CD, blog or more, please visit www.missrainsong.com) Our traveler finds an envelope, containing a note, clipped to Miss Rainsong by a capo. He reads the note and their journey together begins. Our traveler eloquently tells the story of how they spent a few years together riding the rails together. As not to give away the big reveal, I will leave the story here. Throughout the storytelling Martin plays thirteen pieces of original music loosely linked to the story at hand. The genius behind Martin’s writing of Miss Isabella…Companion is that those songs can be replaced by songs from another storyteller without taking away from the overall production. Martin’s music combined with his story made this particular show special. However, it would be nice to hear someone like Anthony Kiedis perform this piece and use song that he wrote. The whole concept is brilliant and just works. If there is one thing that I would change in the production, it would be the number of songs. The story its self is strong enough to stand on its own. For me, thirteen songs were a bit much and I would cut it down to ten; five in each act, but still add Isabella’s Rain Song at the end. Ten would keep the show moving and still provide a nice sample size of Mr. Martin’s work. 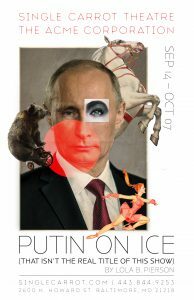 This show should not be missed. It is an evening of entertainment bliss. Unfortunately, at the time of this review there are no future events scheduled for Ross Martin or Dolly Rainsong. Please visit the website for future shows. As Jason would say, “This is what I thought of Isabella Rainsong and Her Traveling Companion” … What did you think? Please feel free to leave a comment! You can find more information on YouTube or by going to www.missrainsong.com.